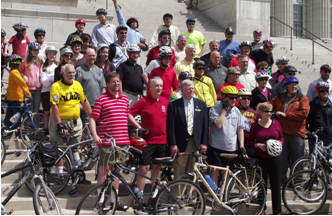 This year we're celebrating the 20th Annniversary of the Missouri Bicycle and Pedestrian Federation, which was started back in November 1994 by a small group of dedicated folks who wanted to improve the situation for bicycling, walking, and trails in Missouri. During our 20th Anniversary Celebration, we're going to take a look at some of the years gone by--in this case, a year not-too-long gone by: 2012. 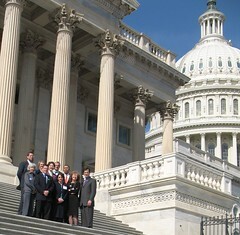 This was a rather amazing year in MoBikeFed's history, with major victories in Congress, at the Capitol in Jefferson City, in helping establish a powerful bicycle and pedestrian advocacy group in Missouri's largest city, and helping start Missouri's first-ever bike share system--and so much more. $13.5 million Bike/Ped Priority Projects List continues implementation. More projects on the list we jointly developed with MoDOT and MANY partners from around the state are funded and/or completed. The number of Complete Streets Policies in Missouri continues to grow - 22 policies by the end of 2012, up from just three policies in 2007. Over 1.2 million Missourians live in a city with a Complete Streets Policy; over 5 million residents of Missouri and adjoining states live a Metropolitan Planning Commission that has adopted a Complete Streets Policy. The National Complete Streets Coalition again judged a number of Missouri policies as being among the very best in the nation. Stopped another proposed bicycle ban - which morphed into a 'reflective vest' requirement later in the session, before much work by MoBikeFed, our allies and supporters finally killed the proposal. Other major legislative progress on many fronts: Great Rivers Greenway/Arch parks & trails proposal gets the green light in Jeff City; Jackson County trails funding proposal gets the green light; municipal transportation funding proposals can now include sidewalks & trails; major bike/ped river bridge named after former MoBikeFed Chair Bob Watts; Bike Rack/license plate issue solved by clever legislative solution. National & statewide bicycle touring routes make significant progress; Way of American Genius Bicycle Route (parelleling Hwy 36) created; work towards official adoption and signage of TransAmerica Trail (US Bicycle Route 76) nears completion. Continued to work with national bicycle and pedestrian advocacy groups for better, fairer funding for bicycling and walking in Congress. Major victory early in the year as federal bike/ped funding is preserved, despite fierce and determined opposition by key national groups and Congressional leaders. 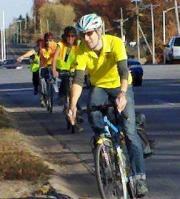 Continued the work of the Missouri Safe Routes to School Network, now in its second year. The Network brings together over 100 organizations, agencies, staff, elected officials, and individuals in the fields of health, education, transportation, planning, and advocacy. Action 2020 Workshops– The Foundation was a partner, along with the Missouri Association of Councils of Government (MACOG), Advocacy Advance, the League of American Bicyclists, the Alliance for Biking and Walking, and local partners including MoDOT and the Pioneer Trails Regional Planning Commission, to bring two Action 2020 Workshops to Missouri. These workshops, presented to over 80 municipal, agency, and organization staff from across Missouri, taught participants how the new MAP-21 federal transportation funding works and how to maximize the potential of this funding. Advocacy and Complete Streets Training Sessions: We partnered with Missouri Livable Streets and other key advocacy organizations across Missouri, including PedNet, Trailnet, BikeWalkKC, and KAMotion, to help develop a training session that gives community members like you the information, tools, techniques, and know-how to work for Complete Streets. 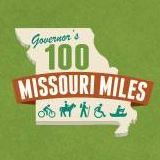 Promoted bicycling and walking and educated Missourians about bicycling, walking, trails, and safety through our web site, e-news, and regular media releases, with over 100,000 web site visits and over 100 earned media placements in 2011. Continued to act as fiscal sponsor for BikeWalkKC, an important new advocacy group in Missouri’s second largest metropolitan area. In 2010, Kansas City stood as possibly the largest U.S. city without an organized, effective bicycle/pedestrian advocacy group. And it showed—Kansas City has recently been ranked as the worst city for bicycling of the 50 largest U.S. So it is imperative, not just for Kansas City itself, but for the health of the bicycling and walking movement in Missouri, to turn that situation around. The BikeWalkKC project has been a tremendous amount of work on both sides, but also tremendously effective, as BikeWalkKC has developed as a major force on the state's bicycle and pedestrian advocacy scene in a very short period of time. Bike Share: In 2012, the Foundation was able to act as fiscal sponsor for a $350,000 grant from Blue Cross/Blue Shield of Kansas City to start Missouri’s first Bike Share program. Kansas City B Cycle has now completed its first successful season—and will be the first of several bike share programs in Missouri. See the complete 2012 Foundation Annual Report for details. Donations to the Foundation, a 501(c)(3) charitable corporation, are tax-deductible. Click here to make a donation to the Foundation here. Your membership and generous financial support has helped our Vision become reality! Thanks to you, the ambitious five-year Vision for Bicycling and Walking in Missouri we set in place back in 2008 has been fulfilled beyond our wildest dreams. 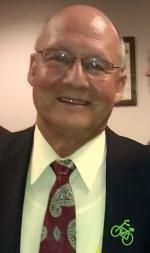 Rep. Cauthorn sponsored a bicycle ban bill - and ended the day wearing a bicycle pin! We are now in the process of re-visioning. Consider a tax-deductible donation in support of Foundation's educational, outreach, and policy work. Right now (January 2015) your membership or donation is matched TWICE by two groups of generous donors. There has never been a better time to join, renew, or make a special donation! » Next story: 20th Anniversary Blast from the Past: What was MoBikeFed doing in 2004? Annual Reports for 2012 - What has MoBikeFed done for YOU lately?